This is a very worthy restoration project. 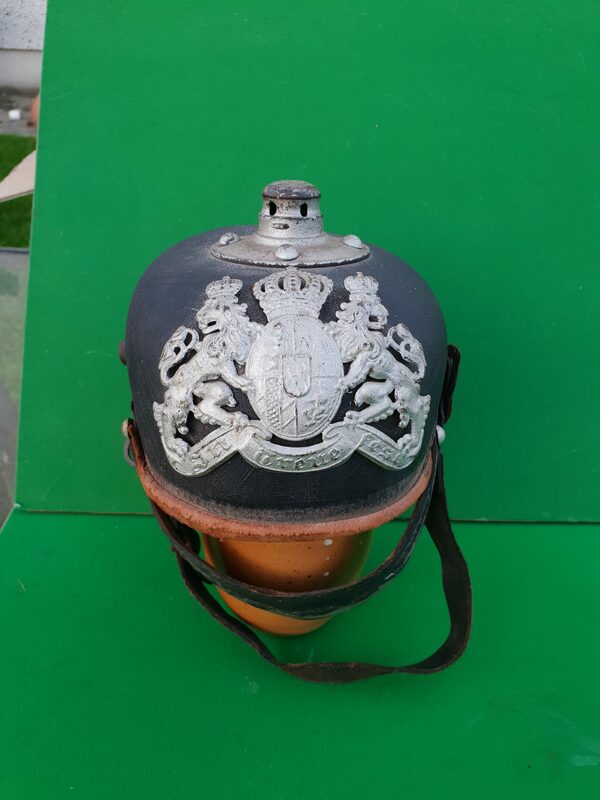 It’s an original Bavarian pre – World War One era pickelhaube. 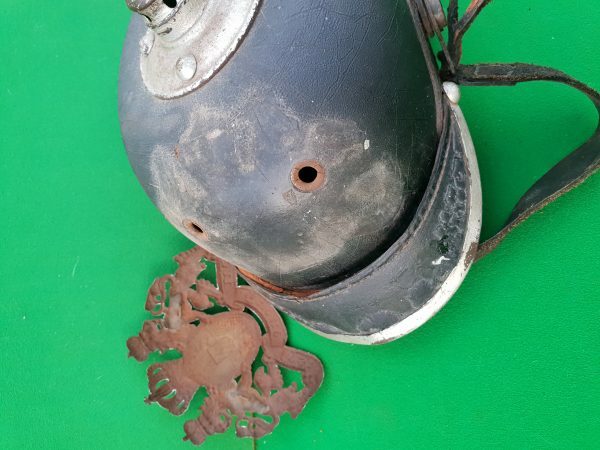 The piece is fully intact (except for the spike and cocades), though in need of restoration, its a great project for any Pickelhaube or Great War enthusiast. 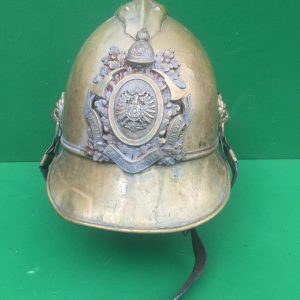 BAVARIAN OR’S leather helmet circa 1910. 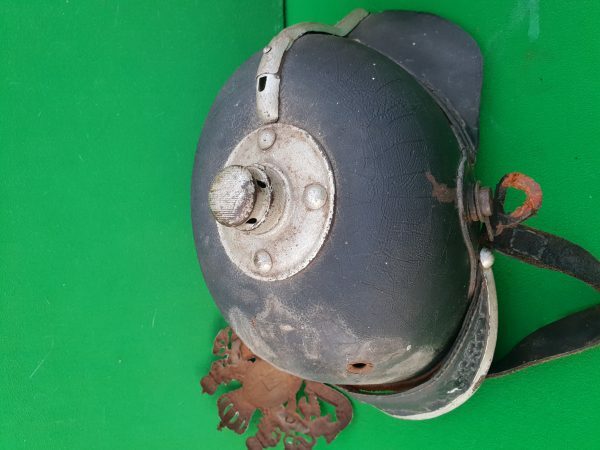 With the exception of the helmet spike and Bavarian cocades, this helmet has all its original component parts. 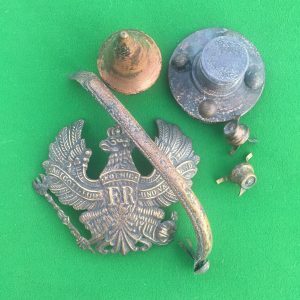 This would make a great restoration project and is worthy of bringing this piece back to its original pre – Great War appearance. 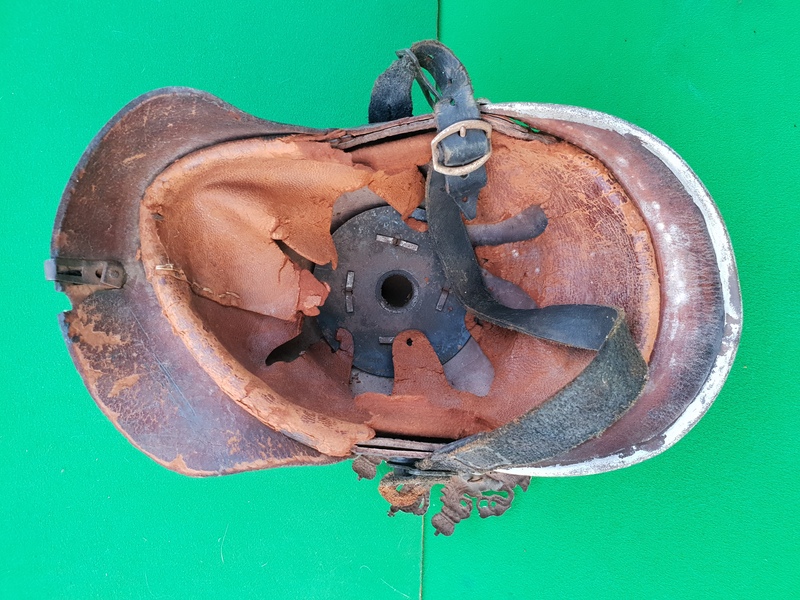 THE LEATHER SKULL – This is in good solid condition. It could do with a good polish to bring it back. There is in a bit of a warped appearance on the back left of the helmet. 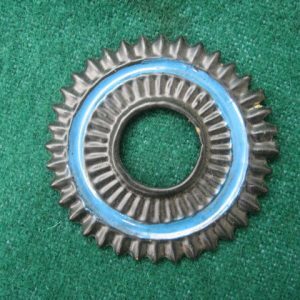 The cause of the warp is due to the helmet lying in the same position for many many years. This isse with the helmet could be straightend out with a little work during the restoation project. 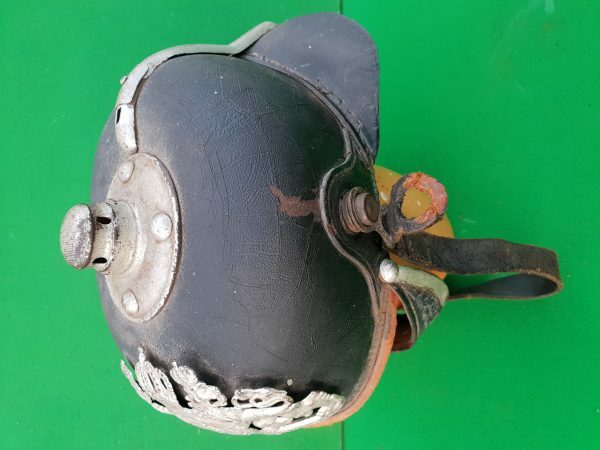 THE FRONT AND BACK PIECES – The front visor piece is attached to the skull by way of the two metal side bosses. Other than that, it’s not secured as the stitching has seperated from the skull. This visor piece can be re-attached either by re-stitching or by glueing. If you choose the latter, I’d suggest a wood glue which works superbly well on leather. There is some bubbling to the front piece. The back piece is generally well secured to the skull but needs some straightening to restore its origianl appearance. THE LEATHER CHIN STRAP: The strap is complete, in great condtion and totally original to the piece. THE INTERAL LINER: This is also totally origianl to the helmet. Good soft leather liner which has not in any way dried out over the years. It does however need some attention in parts. THE METAL FURNITURE: As I stated previously, the metal furniture is complete with the exception of the spike and side cocades. 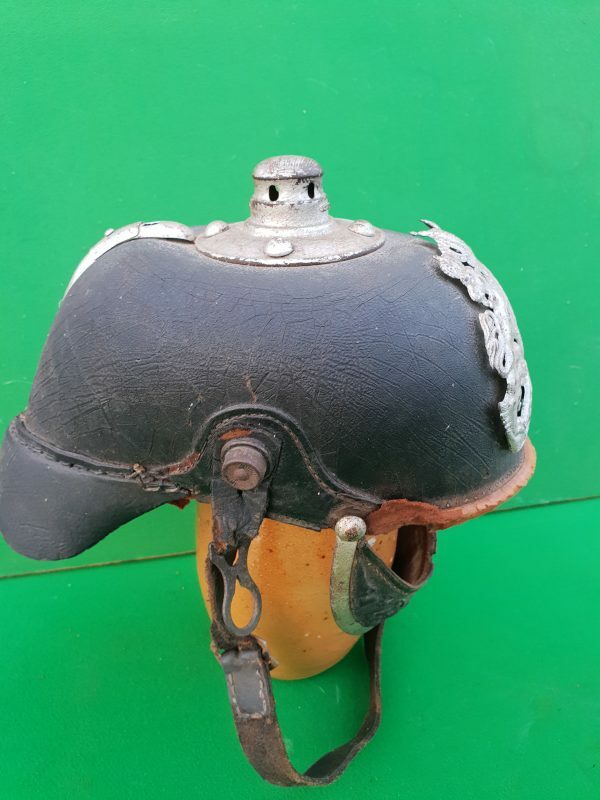 At some stage the metal furniture on the helmet was painted silver, this can be removed during the restoration process. THE HELMET PLATE: A Good quality, metal, die struck Bavarian plate with Bavarian State wappen, crowned lions and with the Motto ”In Treue Fest” The helmet plate retains both connecting loops to the rear. This is a good and original other ranks helmet plate that has been painted in a silver colour. The silver could be easily removed. This Bavarian pickelhaube is a real sleeper. 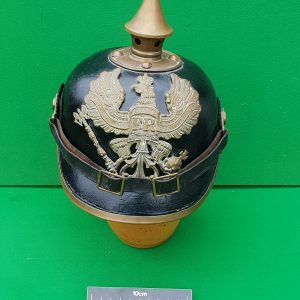 It is crying out for a loving home and owner that will take the time to restore the pickelhaube to a more display worthy condition.